On April 19, 2013 I posted the blog entry, “Common Sense” where I recounted a meeting between a group of kindergarten teachers and retired Kindergarten teachers with the man who was the Chief Academic Officer and Senior Deputy Chancellor at the New York City Department of Education. Our goal was to urge him to help restore developmentally appropriate practices in kindergartens in public schools across the city. In addition we wanted an end to the endlessly inappropriate assessments that were taking much time away from the teacher’s meaningful interactions with students. To his credit, he did extend the 20 minutes originally allotted to us and listened to our examples and our frustrations. To my amazement, though, he told us that he actually had not given much thought to kindergarten! Now this official is the president of the prestigious Bank Street College of Education and he has co-authored an op ed essay that includes the statement, “Play is also fun and interesting, which makes school a place where children look forward to spending their time. 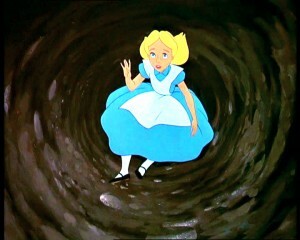 It is so deeply formative for children that it must be at the core of our early childhood curriculum.” I feel like Alice who has just slid down the rabbit hole. Is this the same person who just a little more than a year ago admitted that he hadn’t really thought about kindergarten? When I fumed about what I saw as a politically advantageous flip flop, a Bank Street professor, pointed out that Diane Ravitch made a change in her viewpoints when she realized what was right for children. When I mentioned this to my husband his response was, “Diane Ravitch came out and said that she originally was mistaken in her thinking and actions. This man has said nothing about having a change of heart and apologizing for his negligence when working in a powerful position at the Department of Education. I’m waiting for him to say something that will make me feel more comfortable about his essay and that will stop this fuming feeling that I have. Read the essay and let me know what you’re thinking about my reactions to this perfectly written description about the needs of early childhood contrasted with what happened to early childhood education in the hands of the Department of Education these past few years. WITH the introduction of universal pre-K in New York City, we have created a new entry point into our public school system. This raises a key question: What do we want our children’s first experiences in school to be? What does a good education look like for 4-year-olds? This summer, Bank Street College of Education led training for 4,000 of New York’s pre-K teachers, including both veterans and hundreds of people who started teaching pre-K for the first time last month. Worried teachers talked about how the pressure to achieve good outcomes on the third-grade state exams has been trickling down to early childhood classrooms in the form of work sheets, skill drills and other developmentally inappropriate methods. The problem is real, and it is not unique to New York City. Earlier this year, Daphna Bassok and Anna Rorem, educational policy researchers at the University of Virginia, found strong evidence that current kindergarten classrooms rely too heavily on teacher-directed instruction. Their study, “Is Kindergarten the New First Grade?” revealed that the focus on narrow academic skills crowded out time for play, exploration and social interaction. In a 2009 report for the Alliance for Childhood, “Crisis in the Kindergarten,” Edward Miller and Joan Almon reported that kindergarten teachers felt that prescriptive curricular demands and pressure from principals led them to prioritize academic skill-building over play. This is a false choice. We do not need to pick between play and academic rigor. While grown-ups recognize that pretending helps children find their way into the world, many adults think of play as separate from formal learning. The reality is quite different. As they play, children develop vital cognitive, linguistic, social and emotional skills. They make discoveries, build knowledge, experiment with literacy and math and learn to self-regulate and interact with others in socially appropriate ways. Play is also fun and interesting, which makes school a place where children look forward to spending their time. It is so deeply formative for children that it must be at the core of our early childhood curriculum. What does purposeful play look like? When you step into an exemplary pre-K classroom, you see a room organized by a caring, responsive teacher who understands child development. Activity centers are stocked with materials that invite exploration, fire the imagination, require initiative and prompt collaboration. The room hums. In the block area, two girls build a bridge, talking to each other about how to make sure it doesn’t collapse and taking care not to bump into the buildings of children next to them. In an area with materials for make-believe, children enact an elaborate family scenario after resolving who will be the mommy, who will be the grandpa and who will be the puppy. Another group peers through a magnifying glass to examine a collection of pine cones and acorns. On the rug, children lie on their stomachs turning the pages of books they have selected, while at the easel a boy dips his brush into red paint and swoops the paint mostly onto his paper. The teacher observes and comments. She shifts from group to group, talking with children about their work (“I see that you made a big red circle.”); helping children resolve a conflict (“You both want to be the mommy. What should we do?”); posing an open-ended question to stimulate exploration and problem-solving (“What do you notice when you use the magnifying glass that is different from when you use your eyes?”); and guiding children to manage themselves (“When you finish your snack, what activity would you like to choose?”). Earlier in the 20th century, the Russian psychologist Lev Vygotsky made the related argument that children’s thinking develops through activity-based learning and social interactions with adults and peers. When teachers base their curriculums on Dr. Vygotsky’s ideas, there are significant benefits for children’s capacity to think, to plan and to sustain their attention on difficult tasks. Play has long-lasting benefits. What is referred to as self-regulation in preschool becomes resiliency in high school. The University of Pennsylvania psychologist Angela Duckworth has found that this trait, which she famously calls grit, can make or break students, especially low-income students. Over the past three years, the New York City Department of Education developed a framework to support the core behavioral elements that drive college and career readiness. Many of them — persistence, planning, the ability to communicate and the capacity to collaborate — have their roots in early childhood. Next fall, there will be more students in pre-K in New York City than there are in the entire school system of Atlanta or Seattle. To his credit, Mayor Bill de Blasio has not only pushed for expanding access but has also insisted on improving quality and put real money into training and materials. This is a strong start. But we still need to help parents, administrators and policy makers see what the children themselves know intuitively: Classrooms that pulse with meaningful play are our smartest investment. Shael Polakow-Suransky, who served as senior deputy chancellor of the New York City Department of Education from 2011-14, is the president of Bank Street College, where Nancy Nager is a professor of education and child development. This entry was posted in Investigating Choice Time: Inquiry, Exploration, and Play and tagged Bank Street, Down the rabbit hole, Nancy Nager, Shael_Polakow-Suransky on October 24, 2014 by Renee. “Play has long-lasting benefits. What is referred to as self-regulation in preschool becomes resiliency in high school. The University of Pennsylvania psychologist Angela Duckworth has found that this trait, which she famously calls grit, can make or break students, especially low-income students. Over the past three years, the New York City Department of Education developed a framework to support the core behavioral elements that drive college and career readiness. Many of them — persistence, planning, the ability to communicate and the capacity to collaborate — have their roots in early childhood. I don’t want them designing early childhood education anywhere. So sad about Bank Street. Yes, Renee, you got this one right! I have taught Pre-K for 13 years and Kindergarten for going on 3 years, during the sea-change of educational policy in early childhood curriculum. The NY Times op-ed on play is disingenuous, and in fact now reads like an plug for Bank Street College, since the author cited the seminars for 4000 Pre-K teachers there this past summer. He wants to be sure to jump on that bandwagon himself, and I don’t trust him one bit. I especially don’t trust his understanding of the purpose of play in development, considering play exists and promotes brain development in all species of mammals, with biological imperatives. Indeed, a copy of the op-ed was in my mailbox at school today. I am already hearing how I can “teach math, social studies and science through play” in activities that I would hardly describe as falling under the category of actual genuine play. Play is self-directed activity with a rich variety of materials. Block play, for example, does not have to turn into some kind of counting game or specific building project with written components. It flows naturally, children constantly act on their own individual ideas and constantly make decisions, living in the moment and experiencing mindful activity. My favorite story about someone trying and failing at orchestrating block play was when a Teacher’s College staff developer came and told us how to make the children demonstrate an understanding of literacy setting in their block play by making the houses in the story Caps for Sale with the blocks. Caps for Sale is a wonderful tale, and I read it every year, but the houses in the illustrations are just about all the same. I laugh again just remembering how the children obliged her for a minute, finding red blocks for the roofs, and then told her they didn’t want to do that any more and they had other plans for a subway and a canal or two, that made more sense to them. I just remember the look of disbelief and pity they had for the poor grown up who had to rely on a book for her ideas of what to do in blocks. Thanks for pointing out the inconsistencies, Renee! I totally agree with you Janine. It’s so frustrating because people NOT in education feel that I’m presenting a sour grapes view. Maybe I should have written my post differently, pointing out the positive AND negative aspects of the op ed piece rather than just venting about Shael. Play leads to natural learning among humans as does storytelling, movement, building, and games. It’s about in the moment interaction and activity that helps children develop over time. Childhood provides time for thinking, creating, building, talking, drawing, dancing, playing and through that children learn complex communication, problem-solving, reasoning, and collaboration skills. Children should be viewed as competent humans who deserve to be given the time of childhood. They don’t need to be hurried toward workforce and college. And as for Duckworth’s grit, all children need abundance and perhaps a little slack in their lives like their middle class peers receive. It’s a different perspective on what creates a pathway to success. Thanks for a fab post.